With the Easter weekend right around the corner, many of us are beginning to think about our gardens and what we want to do with them this season. Whether you have a small or a large garden the addition of a Pond is an excellent idea and is always a popular choice amongst many of our customers. One of the main reasons that people opt to add a pre-formed pond to their garden is not necessarily as a focal point. Don't get me wrong, a garden pond is a great way to create that special focal point in any garden and create an added sense of serenity. However, one of the main reasons that people chose to install a garden pond is that it will attract various forms of wildlife. Squirrels, frogs, and birds will soon begin to frequent the area, allowing you to watch nature at work from the comfort of your own patio! One key thing that is often overlooked when installing a garden pond is the location. If possible, choose a location that receives close to 5 or 6 hours of sunlight per day. Do not place your pond directly under a tree, because cleaning a pond full of leaves and other debris can become very unfavourable. There are many different approaches to installing a garden pond of your own, but many people prefer to have a more natural looking wetland area and opt to edge the pond with rocks. These rocks can be found at any local garden centre or online. Once the pond installed and decorated, one of the most common things to do with your new pond is to add fish. Fish are not only great to look at they but will also play a big part in the garden habitat you’re creating. When it comes to encouraging wildlife to your new preformed garden pond you may want to consider placing a few pond stones and water lilies in there to help smaller creatures such as frogs get around. Pre-formed ponds are a brilliant way to create a small wildlife habitat in your garden. All you need is a small amount of space, a spade, and a strong back (or at least know where to find one!). Our pre-formed pond liners are made of plastic, are lightweight, and easy to install. Easy to follow directions come with the liner, and we have many different shapes and sizes available on our UK Water Features website. You can make your garden pond look natural by surrounding it with stones, bedding material, or anything else that disguises the top edge. Once your pre-formed pond has been created, it won’t take long for wildlife in your area to begin to frequent your garden. From birds and amphibians, to small or (even large) mammals, you should soon see a wide variety of wildlife visit your garden oasis for water, food, or shelter. Depending on your location and the type of wildlife you want to attract, you can surround your pond with the plants and other habitat enhancements that certain wildlife favour. You can feel good that you have done your small part to make life more enjoyable for our animal friends, while you get to enjoy viewing them in their natural habitat. Creating a wetland area in your garden is a brilliant solution to dealing with waterlogged soil. Instead of abandoning these boggy areas of your garden, plant a wetland are and enjoy the many beautifully coloured birds and butterflies that it attracts. Many plants thrive in wetland conditions, including grasses, petunias, irises and lilies. It is advisable to use a diverse selection of plants in order to attract the widest variety of wildlife to your wetland garden. So long as the plants have similar flooding needs they may be planted together in a wetland area. As we mentioned, we have lots of great Pre-formed Ponds and Pond Liners available on our website, so you can select the correct size for your needs and be away getting your pond started in no time at all! We also have some fantastic Pond Kits to help make your job even easier, ensuring you have everything you need in the kit to create a stunning focal point. These kits come with a pump, meaning you can create your very own fountain in your pond too, because after all, there’s nothing more relaxing than the sound of flowing water! One of our best-selling pre-formed ponds that comes complete with a quality libel pond pump wit 10 metres of cable. Another great selling pre-formed pond, complete with a quality 600LPH pond pump and 10 metres of cable, this kit has everything you need to create the perfect garden pond! This great pond kit comes with a solar powered floating lily fountain for added effect! 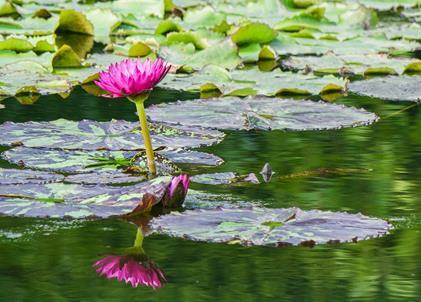 Simply pop the pond into the ground, fill with water, position the lily and sit back and relax! This pond comes complete with a small solar powered fountain pump and float. Simply pop the pond into the ground, fill with water, position the solar pump and relax! It really is that easy to add the soothing sound of water to your garden this year. The kit comes with 600LPH pump, all you need to do is dig the hole, fill the pre-formed pond, place the pump in the water and you’re ready to go! This is another pond that’s ideal for creating a perfect wildlife habitat! The kit comes complete with a 600LPH fountain pump and 10m of cable, meaning you can place anywhere in the garden you like and have plenty of wiring to reach! We hope this blog will have helped if you’re considering purchasing a pond for your garden this year. Check out our full range of Preformed Ponds, Liners and Accessories on our UK Water Features website, to find everything you need to update your garden space this summer time!